As I write this, I can still smell the heady lavender tones of Hitchin Lavender fields, and perhaps the lavender will reach you across your screens too. 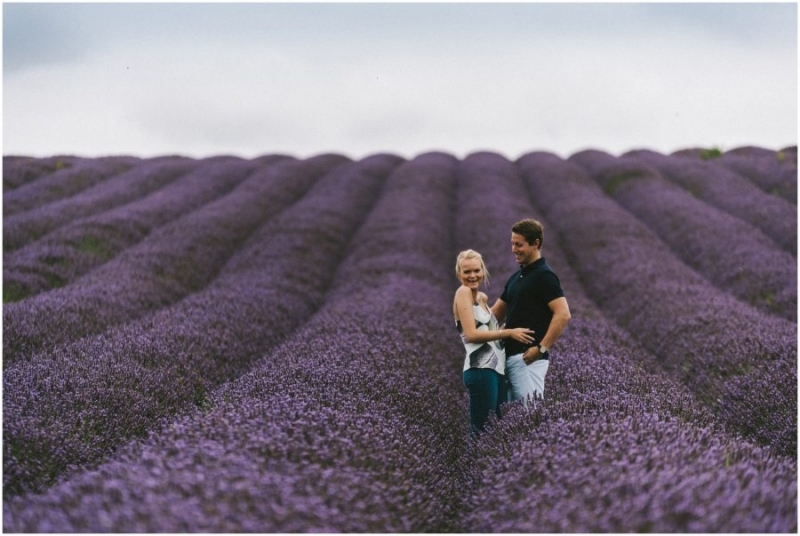 I was thrilled when Madeleine & Tom suggested Hitchin Lavender for their pre-wedding shoot, it is hard to believe such a place is in Britain, it looks like somewhere from the pages of a travel magazine! Not to mention, I will be flying to Spain to be their destination wedding photographer in September, far atop the mountains of Granada, Andalucia. I have to keep pinching myself! We waited for the flowers to be in full bloom and arrived early at the lavender fields to avoid the rush. The rolling hills create the perfect back drop as the purple meets the sky, and the fields look never-ending. The three of us spent an hour walking through the rows and picking lavender, and Madeleine was even stung by a bee, poor thing! Aside from me suggesting where Mads & Tom should stand, I feel like they did all the hard work for me, by being so wonderful and they looked fantastic. We moved between a few locations to get as much variety as possible in the pictures, and when we were done we headed to nearby Hitchin for a coffee and a bite to eat. It was the perfect opportunity to talk about their wedding and to get up to speed on their plans. Madeleine & Tom were absolutely fantastic to photograph, they were so relaxed in each others’ arms, I could not be more excited for their wedding in Spain this September!